Please view our website with Firefox or Chrome browsers. Internet Explorer (IE) browser is not compatible with some features of our website. 2) Prices for UK & EU include VAT. Prices for the rest of world exclude VAT, as VAT is exempt. Channel Islands customers are also exempt from VAT. 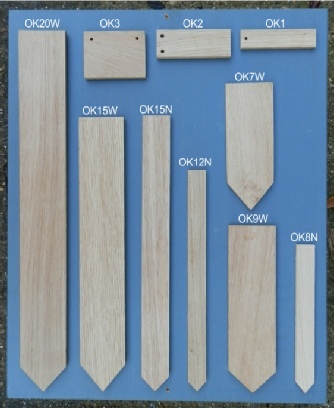 Hand made in our furniture workshop ( www.andrewcrace.com ) from FSC English and European Oak. These beautiful labels will last for many years and can be written on using our Alitag pencil or for bolder writing use a ‘permanent’ pen or a paint pen. 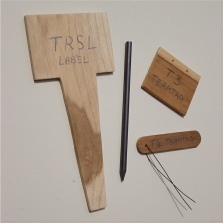 The labels can be used again by using a rubber to erase the pencil or by lightly sanding the surface with a fine sandpaper. The Alitag pencil when written firmly on the oak surface will last for many seasons and will not bleed into the wood grain as some ‘permanent ‘ pens can. Our Oaktags are available in hanging and stick in designs. The hanging labels can be tied onto the plant with garden wire (or some of our plastic strand or palm hemp twine). These hanging labels also make good gift tags for presents and can be tied to a parcel with raffia, string or a ribbon. The Alitag pencil is made from solid pure graphite which is darker than ordinary HB pencil. But unlike ordinary HB pencil, the Alitag pencil has no wood round it. The whole pencil is a solid rod of pure graphite measuring 7mm in diameter and 175 cms long. hidden by the tallest spinach or beans. mark a tree planted to remember a loved one.